It was a pretty crazy week, wasn’t it? So much happened at Chambers Bay that instead of trying to wrap up just the final round, I’m going to post some thoughts in point form and we’ll see how long it gets. Also, please make sure that you read both Kyle Porter and Shane Ryan on Sunday’s crazy finish. They’re both more than worth your time. When Phil Mickelson won the Open Championship two years ago, it was a shock. For the longest time, Mickelson and the Open Championship were as compatible as Augusta National and Gary McCord, but somehow, he pulled it off at Muirfield and the focus shifted to the major that he really should have won at several points in his career, the U.S. Open. With six runner up finishes, Mickelson has experienced the full gamut of defeat at his national championship, but in the last two years, he’s been an absolute non-factor. Granted, Martin Kaymer was the only factor last year at Pinehurst, but after a strong start on Thursday at Chambers Bay, Mickelson wasn’t anywhere near the lead at any point on the weekend after a Saturday 77. The general consensus has always been that Mickelson would win a U.S. Open at some point based on his talent and track record, but he’ll be 46 years old when he tees it up next year at Oakmont, so it’s pretty obvious that time is running out for him to attain the career grand slam. It used to be news when Tiger missed cuts, but now it’s a big deal when he makes one. Until he figures out this new swing, if he figures it out, we just have to get used to the fact that this is the new normal. Somehow, Louis Oosthuizen was able to collect himself after his debacle on Thursday and he almost stole this championship. He was twelve shots back of the lead after the opening round but went 66-66-67 over the final three days to make it way closer than it should have been, and that included a front nine 38 on Sunday. There’s never been any doubt about his talent, but his injury history has kept him from truly breaking through into the elite class of players on the PGA Tour. In a few weeks, he’s definitely going to be listed in about 90% of everyone’s betting previews for the Open Championship too, as he’s hot and going back to the Old Course, site of his seven shot romp back in 2010. I know that a lot of people were probably pulling for Jordan Spieth, or even Dustin Johnson, to come away with the win at Chambers, but watching Branden Grace eject himself in such spectacular fashion wasn’t easy. Grace is a very good player, but he probably doesn’t get enough credit for his ability because he plays almost exclusively in Europe. 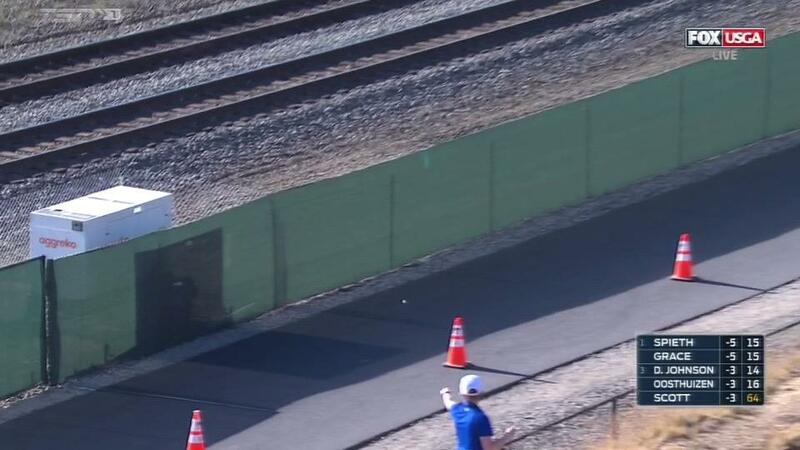 There were definitely people watching him for the first time on the weekend and their memory of him is now going to exclusively about him nearly landing a tee ball on the train tracks at Chambers Bay while tied for the lead on the 16th tee. It’s impossible to say whether he was nervous, or if it was just a bad shot at the worst possible time, but regardless, it’s difficult to not feel for the guy when there’s so much on the line. In one of my preview pieces for theScore, I said that there was little buzz about Rory McIlroy coming into the event and I posited that it was simply because his dominance has become routine and expected, so people are trying to find other angles and players to look to in events like this. Outside of a brief run during Sunday’s final round, no one was really talking about Rory in any way. He clearly didn’t have his best last week and it’s understandable, even for the best player in the world, but he still finished in a tie for 9th which is further proof of how good he really is. He doesn’t have the relentless consistency that Spieth has now or that Tiger had at his peak, but in the deserved hype around Spieth’s victory, try not to forget about Rory. Watching Jason Day collapse on Friday with another bout of vertigo was just awful, and I was happy to see that he was able to get through the weekend and finish, even if it didn’t end up the way he would have liked. Hopefully he can manage to get healthy because there’s no doubt that Day has an incredibly bright future and no one wants to see it get derailed. Outside of that, I thought the camera work was interesting. Greg Norman and Joe Buck had moments where they were good, as did Shane O’Donoghue, but the rest of it wasn’t particularly good and to be honest, I think it comes down to the simple fact that just because you’ve got a ton of experience broadcasting sports, it doesn’t mean that you’ll be able to adequately broadcast a golf event. Simple things like knowing when to switch off of the Pro Tracer and follow the ball, or just showing more golf instead of going to one of your four-man panels to talk about what’s happening are clearly things that we take for granted when watching coverage on NBC, CBS and ESPN. Both NBC and CBS have been broadcasting golf since the 50’s, and it shows. Fox running a promo narrated by a tree is as stupid as it sounds, believe me. I look forward to congratulating the 2015 US Open Champion very soon, I simply didn't play well enough to be remotely close. This is not sour grapes or moaning or any of that crap. It simply the truth. Mike Davis the head of the @USGA unfortunately hasn't spoke the truth about the conditions of the greens. I feel very sorry for the hundreds of greens staff who spent countless hours leading into this week and this week doing there best to have it the best they could and I thank them for that. But look at the picture. This was the surface we had to putt on. It is disgraceful that the @USGA hasn't apologized about the greens they simply have said. "we are thrilled the course condition this week". It wasn't a bad golf course, In fact it played well and was playable. What wasn't playable were the green surfaces. If this was a regular PGA tour event lots of players would have withdrawn and gone home on Wednesday, but players won't do that for a major. They were simply the worst most disgraceful surface I have ever seen on any tour in all the years I have played. The US Open deserves better than that. And the extra money that they have earn't this year from @FoxSports, they could easily have relayed the greens so we could have had perfect surfaces. Simply not good enough and deeply disappointing for a tournament of this magnitude. I don't like it when people lie on camera to try and save face. And to all you fans that paid good money to try and watch us play golf but couldn't see anything on most holes because it wasn't possible to stand on huge slopes or see around stands, I apologize and I'm sorry you wasted your money traveling to be disappointed. I hope we all learn something moving forward to not have these problems in the future. Happy Fathers Day. You get the point, and I’m sure that unless something changes on the greens, we’re more likely to see Ty Tryon before Chambers again, but even though the conditions were less than ideal, they were the exact same for everyone. Spieth, Johnson, Grace and everyone else at the top of the board played on the same greens as the guys who missed the cut and they seemed to do just fine. Does the USGA take things too far? Yeah, I think they do at points, but honestly, it happens every year and you can’t act surprised when it does. I also don’t blame the players for speaking out against what they think is unfair because they should share their opinions and not be afraid of the governing bodies. Both of these things can be true: the players need to be better and so does the USGA. 2010 U.S. Open at Pebble Beach: Johnson holds a three shot lead going into Sunday, but loses six shots in the first four holes en route to firing an 82 and finishing tied for 8th. It happened so fast, and early in the round, that everyone, presumably Johnson included, had come to grips with the result long before it happened. 2010 PGA Championship at Whistling Straits: Johnson makes birdie on 16 and 17 to take a one-shot lead, but bogeys 18 to get into a playoff with Martin Kaymer and Bubba Watson. On further review though, it is determined that Johnson grounded his club in a “bunker” on 18, leading to a penalty and causing him to miss out on the playoff. Debate still happens today about the incident, but Johnson should have been safe and confirmed. It’s that simple. 2011 Open Championship: Johnson starts the day one shot behind Darren Clarke, and puts one out of bounds on the back nine when he was down two shots, effectively taking him out of the tournament. He would go on to lose by three. But this one was different. Johnson had a two-shot lead going to the back nine and after a stretch of three bogeys in four holes, he actually managed to fight back and give himself a chance after Spieth made a double bogey on 17. After crushing a drive down the middle on 18, and hitting an iron (!!!) into the green on the 600+ yard closing hole, Johnson had an eagle putt from about twelve feet to win the tournament and after barely touching the ball with his putter, Johnson watched as his dimpled friend rolled and rolled and rolled past the hole, leaving him nowhere near a comfortable distance away just to force a playoff with Spieth. Much like Grace, it’s impossible to say if Johnson just made a bad stroke or if he was nervous about missing, but when that putt slid by, the air went out of every room that was tuned to Fox. The only thing that melted down faster than Johnson’s stroke was Twitter, and even though putts like this get missed all the time, it still felt wrong, like Johnson was robbed of what was rightfully his. It was cruel. In other words though, it was golf. In situations like this, it’s very easy to get carried away with hype and what individual moments mean for the greater golf landscape. Throughout the broadcast on Sunday, you couldn’t miss the mentions of the records Jordan Spieth was trying to break and the company he was trying to join. Seeing a 21-year old kid placed among names like Sarazen, Nicklaus and Woods is a strange feeling to be sure, but it really does feel right, doesn’t it? You’d be hard pressed to find anyone who would tell you that Spieth has the talent of Dustin Johnson, Adam Scott or Jason Day, but there’s something about him that makes you feel like he’s going to accomplish something special and that he won’t quit until he finishes the job. Everything about him is just so polished that it’s impossible to not be impressed. After the tournament, Joe Buck tried to get him to comment on the difficulty of the tournament and how bad the greens were, and how did Spieth respond? By deflecting the question about the USGA and turning it into how he understands why teams hate playing the Seahawks because of how great the Seattle fans are. He also made sure to mention Under Armour and said that he wanted to be known as Steven Spieth’s brother. Believe it or not, Spieth wasn’t reading from an actual PR playbook while doing the interview; he’s just that good. On top of that, he’s got the game to back it all up. Labelling Spieth as the next Tiger or as the player who will take down McIlroy is unfair, and I hope that doesn’t happen. We’re watching something very, very special happen right now and I can’t wait to see the next chapter.